Is the Resurrection of Jesus a Qualification for Being the Jewish Messiah? “The state of the world must prove that the Messiah has come; not a tract. Don’t you think that when the Messiah arrives, it should not be necessary for his identity to be subject to debate – for the world should be so drastically changed for the better that it should be absolutely incontestable! Why should it be necessary to prove him at all? If the Messiah has come, why should anyone have any doubt?” (Rabbi Chaim Richman, available at http://www.ldolphin.org/messiah.html). “The only way to define “the Messiah” is as the king who will rule during what we call the Messianic age. The central criterion for evaluating a Messiah must therefore be a single question: Has the Messianic age come? It is only in terms of this question that “the Messiah” means anything. What, then, does the Bible say about the Messianic age? Here is a brief description by famous Christian scholar: “The recovery of independence and power, an era of peace and prosperity, of fidelity to God and his law and justice and fair- dealing and brotherly love among men and of personal rectitude and piety” (G.F. Moore, Judaism, II, P 324). If we think about this sentence for just a moment in the light of the history of the last two thousand years, we will begin to see what enormous obstacles must be overcome if we are to believe in the messianic mission of Jesus. If Jesus was the Messiah, why have suffering and evil continued and even increased in the many centuries since his death.”–David Berger and Michael Wyschogrod, “Jews and Jewish Christianity” A Jewish Response to the Missionary Challenge (Toronto: Jews for Judaism, 2002), 20; cited in Oskar Skarsaune, In The Shadow of the Temple: Jewish Influences on Early Christianity(Downers Grove, ILL: Intervarsity Press, 2002), 302. “The literature of Judaism, both biblical and post-biblical, evidences a much greater interest in the Messianic Age itself and the activity of God during the age than in the person or persons whom God would use to bring about and to accomplish his purposes. One has only to scan the Old Testament passages which look towards the distant future to note that the greater emphasis is given to a description of the Age itself than to God’s anointed instrument who will usher in that Age. While sections and chapters are devoted to the former (e.g., Isaiah 26-29; 40ff; Ezekiel 40-48; Daniel 12; Joel 2:28-3:21), definite references to the latter are confined, in the main, to a few specific verses (e.g., Isaiah 9:6ff; Micah 5:2; Zechariah 9:9)”- Richard N. Longenecker, The Christology of Early Jewish Christianity, 63. The Jewish people knew the God of Israel as the only one who could raise the dead (Job 19:26; Ps. 17:15; 49:15; 73:24; Is. 26:19; 53:10; Dn. 12:2;12:13). Belief in a resurrection of persons from the dead are seen in eight passages: (Job 19:26; Ps. 17:15; 49:15; 73:24; Is. 26:19; 53:10; Dn. 12:2;12:13). 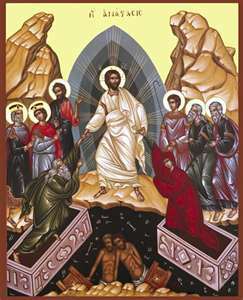 The resurrection terminology is seen in two places (Ezek. 37:1-14; Hos. 6:2) to show a national and spiritual restoration brought about by the return from the exile. So it is not as if resurrection is foreign to the Jewish mind. But sadly, a resurrected Messiah it is not even on the radar screen for many Jewish people. As I have said before, the word “messiah” means “anointed one” and is derived from verbs that have the general meaning of “to rub something” or, more specifically, “to anoint someone.” The Jewish Scriptures records the anointing with oil of priests ( Exod 29:1-9 ), kings (1 Sam 10:1;2 Sam 2:4;1 Kings 1:34), and sometimes prophets (1 Kings 19:16b) as a sign of their special function in the Jewish community. Also, when God anointed or authorized for leadership, in many cases he provided the empowering of the Holy Spirit to do complete the task (1 Sam. 16:13; Isa. 61:1). However, just because someone was anointed in the Jewish Scriptures to perform a specific task doesn’t mean they are “the Messiah.” So we can conclude that “anointed one” was not used as a title with a capital “M” in the Jewish Scriptures. Are there any texts in the Jewish Scriptures that say the Messiah has to be resurrected? Apart from Psalm 16: 1-10 (used by Peter in Acts 2:22-32) and the end of Isa. 53, there aren’t an overwhelming amount of texts that support a resurrected Messiah. This is why when Paul says the Messiah “rose from the third day according to the Scriptures” (see 1 Cor. 15:4), he is probably not referring to a specific text or texts but more to the overall plan of God’s saving activity that has been laid out in the Jewish Scriptures. The “third day” motif that Paul is following is found in Hosea 6:1-2 and other texts that speak of God doing something significant or restoring something on the third day. 1.Ortland says, “In this article, I hope to further extend reflection on the soteriological significance of the resurrection by considering it in relation to Christ’s messianic office of prophet, priest, and king. 2. Christ’s risen and exalted life in heaven necessary for some of his priestly duties, but that it is portrayed in Heb 5:5–10 and 7:16 as the occasion for his appointment to a specific priestly office, namely, the everlasting, intercessory priesthood typified by Melchizedek, in which office he continually applies the saving benefits of his atoning sacrifice to his people. 4.Resurrection —-ascension: The focus of Hebrews is on the exalted life of Christ in heaven, not the resurrection event, which is referenced directly only in Heb. 13:20. Strictly speaking, Jesus’ exaltation to the right hand of God occurred at his ascension into heaven, forty days after his resurrection (Acts 1:3, 9–11). Nevertheless, whatever significance we may attach to the ascension, it is the resurrection that is presented in the NT as the crucial transformation from one kind of existence to another. 5. While it is not initially clear that the coming Davidic king is to be identified with the coming prophet and coming priest, in later passages of the OT the kingly and priestly expectations begin to merge (Psalm 110; Zech 6:13; 49 Jer 33:17–18; 30:21; Ezek 21:26–27; Dan 9:24–27). That prophetic responsibilities also belong to this office is apparent from his role in spreading the the NT (Acts 3:21–23). The hope thus becomes a Davidic hope; the Davidic hope, a full-orbed messianic hope. What picture emerge from the OT about the Davidic King’s rule? God promises the knowledge of God. (Jeremiah 31:34). If Jesus rose from the dead, He can send the Spirit and inaugurate the New Covenant.